KYB RS PRO, engineered by KYB Japan's technology, offers the best in driving pleasure. 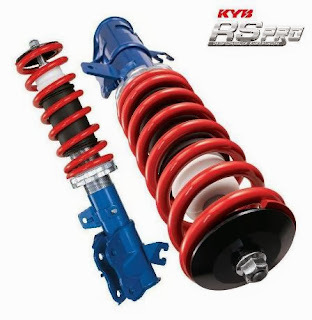 Precision, Responsiveness and Originality is the key to the success of KYB RS PRO performance suspension. Performance Proven by Ralliart, TRD & others brand in its motorsports activities. Trusted name in performance technology. Co-efficient between the damper and spring provides superb handling capabilities Assist in braking efficiency, ensuring safety. Replaceable cartridge for choice of driving preference : soft, medium or hard. For more information, kindly visit >>>here<<<.